I woke up this morning a little nervous about having enough time to make it to our gate. Having never flown through LA, I wasn’t sure what the security lines were like, and I wasn’t sure how long it would take Tim to check the car in. We decided to leave a little earlier than planned so that we could allow ourselves plenty of time. Tim left with the rental car, and Grandmother and I took the hotel shuttle to the airport shortly after. When Tim dropped the car off, he had driven his 5,392nd mile! What a log! 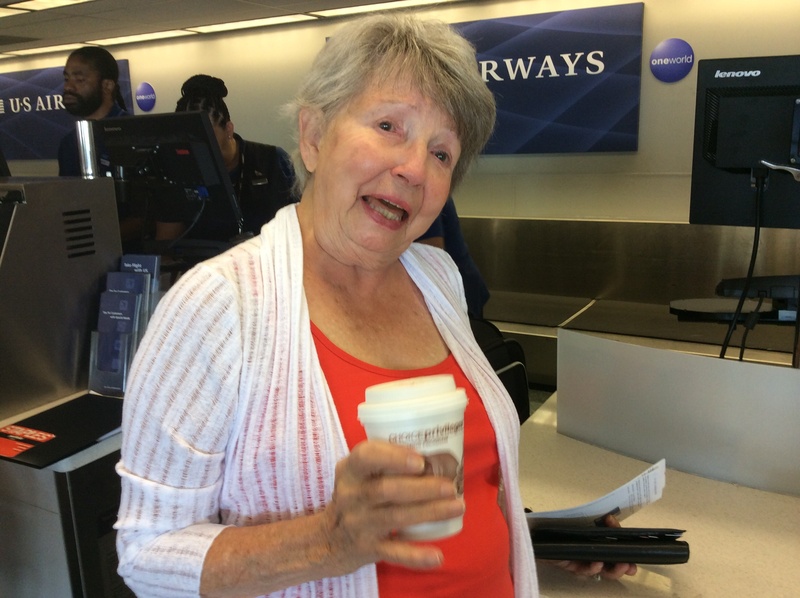 Tim and I were not exiting from the same terminal as Grandmother, so I went with Grandmother to her terminal to make sure she got checked in and on her way. I stayed with her until the wheelchair came to get her, and then I booked it over to my terminal to meet Tim and get checked in. Security went much more smoothly than I expected, so we had a half an hour before boarding that gave us time to grab a bite to eat and take a deep breath. Tim was pretty tired (and why shouldn’t he be? 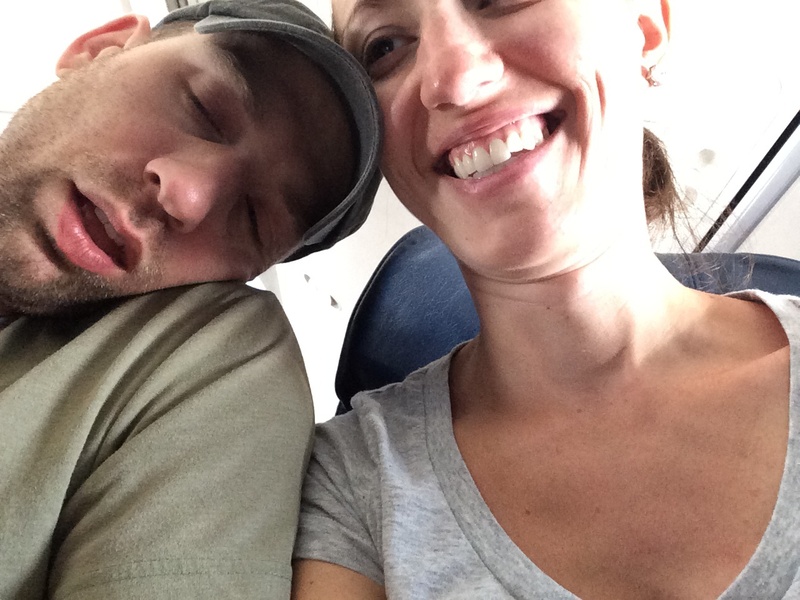 ), so I encouraged him to take a little nap on the plane. However, the Muppets movie was far more interesting than a nap! It was probably for the best, though, because it meant that we were pretty tired by the time we got home and are going to make it to bed at a decent time. Poor Grandmother, on the other hand, is not so lucky. She missed her connecting flight in Charlotte, and instead of staying the night in Charlotte to catch a flight to Huntington tomorrow, she’s taking a late flight into Charleston where Uncle Darrel will pick her up (thanks, Uncle Darrel!). She is going to be beyond tired–she may just sleep through the whole day tomorrow! What an amazing experience! I feel like I’ve actually been out of the country for the last two weeks because I never imagined there were such places here in the US. Any time I think of a great adventure or seeing something beautiful, my first thoughts are always outside our own country. I’m always itching to use my passport, and as a result, I’ve neglected travel right here in America for the most part. The past two weeks have really opened my eyes to the travel opportunities my country offers and made me eager to keep looking for places I’ve left undiscovered closer to home. I won’t say that I’m ready to retire my passport (not by a long shot! ), but I am looking forward to future visits around the good ol’ US of A. Above all, the last two weeks have given me an opportunity I never really had before–the opportunity for uninterrupted, quality time with Grandmother on a larger scale. Growing up, I only really saw Grandmother as part of a larger group where everyone was jockeying for attention. My one-on-one time with her was pretty limited until more recently when I started driving on occasion to visit her for a short weekend. The last two weeks have given me an even better opportunity to actually get to know her, and the result is that I know a different Grandmother than I knew growing up. I feel so fortunate that I have been given this time to build a deeper relationship with her and to learn more about who SHE is. I loved listening to her stories and getting to know her (in a sense) as a child, as a teenager, as a newlywed, as a young mother, as a nurse, and as the remarkable woman she always has been. If I had not had this opportunity, I might have never really known her, and what a sad thing that would have been. So three for the road headed West, and three for the road have now headed back East. We’ve left (or nearly left) the road behind, but the memories we carry from the road will remain. We’ve enjoyed sharing our experience with our friends and family through the blog, and looked forward each morning to see if anyone had written any comments about the previous day’s blog. We took funny, silly pictures we might not have taken had we not had all of you in mind. We recounted stories to make sure we shared them in all their glory with you each day. And now, we have a history of our trip for ourselves that we can revisit any time and relive those special, amazing, wonderful weeks we shared. Looking forward to more adventures–hopefully including adventures shared with each of you! Lauren, you did an awesome job with the blog, I LOVED it!!!! I really appreciate you taking the time to write, it gave us an opportunity to share in your great adventure. I especially loved hearing about your visit with David and LOVED the pictures he looks just the same….amazing! Thanks Timmy for being the taxi driver, you logged A LOT of hours on the road. The good news is, you could drive with ease because it was the right side of the road, the steering wheel was on the side of the car you are familiar with, as well as the gear shift!! YOU DA MAN TIMMY PARKER< YOU DA MAN!!! Loved this trip! Thank you for sharing! !